This book will guide you in getting started with PyQGIS. After a brief introduction to Python, you’ll learn how to understand the QGIS Application Programmer Interface (API), write scripts, and build a plugin. This book is designed to allow you to work through the examples as you go along. At the end of each chapter you will find a set of exercises you can do to enhance your learning experience. 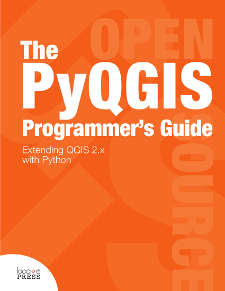 The PyQGIS Programmer's Guide is compatible with the version 2.0 API released with QGIS 2.0. If you purchased the Preview PDF, you can get final version by going to My Books and regenerating your book. Download the code and data for the book.